Weather fascinates in both its variety and vocabulary. A still night can morph into a blustery day. Describing strong winds as well as loud, aggressive talk, blustery has seeped into common culture: young adults bluster on about their night out; a sailor blusters his way through the streets on a foggy evening. And heavy fog is happily referred to in culinary terms as being as thick as pea soup. Yet weather’s extremes must share the forecasts with middle-of-the-road descriptors, such as fair, mild and equable. So if you like your days either hot or cold, you’ll be challenged by a forecast’s murkier terms. Take “partly sunny” and “partly cloudy”. Like most people, you probably thought meteorologists who call skies “partly sunny” have a glass-half-full outlook on life, while those who predict “partly cloudy” weather are more cynical and see the world as a glass half empty. Behold, the terms mean the same thing – well, at least for some, and sometimes. The US National Weather Service defines both terms as when “between 3/8 and 5/8 of the sky is covered by clouds”. And everyone agrees on one big difference: it’s never partly sunny at night, so the term to use when it’s dark outside is “partly cloudy”. But more often than not, we can’t shake the dilemma of deciding which term to use. Wunderwiki’s Weather Underground defines “partly cloudy” as when less than half of a day will be cloudy, or at any one time less than half the sky will be covered by clouds – thus, a preponderance of sun or, dare we say, mostly sunny. And vice versa, “partly sunny” means less than half of a day will be sunny, so it will end up as mostly cloudy. Whichever term is selected can also depend on expectations. If rain is tapering off and skies are clearing up, forecasters may predict “partly sunny” weather because skies will more than likely become sunnier. 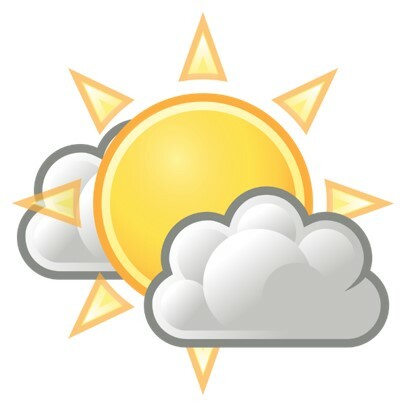 And if the sun is expected to give way to clouds, “partly cloudy” will mark the forecasts. After all this word wiggling, you might throw in your (beach) towel to signify surrender. But some have high stakes in the words chosen. An event organizer will push for a “partly sunny” forecast because it’s more positive than announcing “partly cloudy” skies. Everyone will be partly right and partly wrong. When you leave your umbrella at home and get wet, though, someone else is always to blame for not having forecast “a chance of drizzle”. Next: Next post: What Words Should We Look Forward to in 2019?